Ned Fasullo and his swinging Fabulous Big Band Orchestra are celebrating 20 years of performances. Fasullo and his 16-piece group’s 1,500-song repertoire covers everything from Duke Ellington to Elvis Presley to Queen and the Eagles, but despite the versatility, Fasullo specializes in the music of classic crooners — those Italian-American singing stars Frank Sinatra, Dean Martin, Bobby Darin, Al Martino and Vic Damone. A self-taught vocalist, Fasullo learned to sing by studying hundreds of recordings. The Fabulous Big Band Orchestra backs Fasullo with performances of original arrangements made for Sinatra, Martin, Darin, Sammy Davis Jr. and Tony Bennett. Since 2003, Fasullo has performed “Salute to Sinatra” with the Nelson Riddle Orchestra from coast to coast. Ned Fasullo and the Fabulous Big Band Orchestra will perform 'Salute to Sinatra' at 7:30 p.m. Saturday, March 23, at Baton Rouge Magnet High School, 2825 Government St. Tickets are $31-$41. (225) 636-9839; salutetosinatra.net. The monthly Fade The Flow showcase — an intimate hip-hop closed mic organized by Marcel P. Black in partnership with Michael "Solelab BR" Thomas at UpperCuts Barbershop — is foregrounding women emcees in March with Slay The Flow. 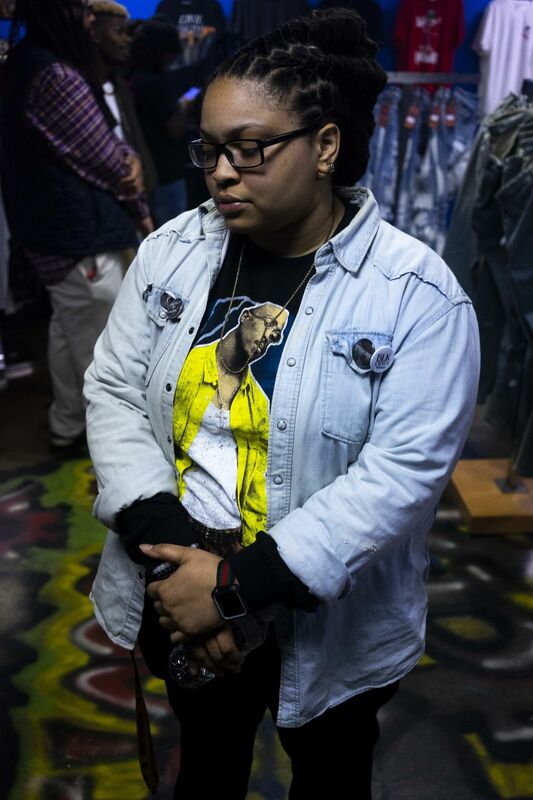 The all women hip-hop showcase will feature Yung Jewelz (pictured) and Shawty 4'8" both from Jackson, Mississippi; New Orleans' Fiyah Like Ayanna; Pensacola, Florida's Mvtha Cvla; Mo Blak from Lafayette; and Cannon Da Assassin. The event will be hosted by Tubbi of The Nerdy Bird with DJ Legatron Prime spinning the music. A couple of vendor tables by Queen Me 31 and Ubiiquity will also be set up. Women emcees, like Sha-Rock and MC Lyte, were instrumental to rap history, and are today some of the biggest names in the industry, but a real gender gap exists at all levels of the hip-hop scene. A showcase like Slay The Flow proves there are talented women emcees working in the region deserving the spotlight. Slay The Flow all-women hip-hop showcase takes place 7 p.m. Sunday, March 24, at UpperCuts Barbershop, 1951 Staring Lane. Free entry and free food (by DJ Slice Dat). instagram.com/fadetheflowsundaysbr. RICHARD BARKSDALE: Big Dog Saloon, Denham Springs, 5 p.m.
BACKLIT STEREO: Superior Grill Government, 6:30 p.m.
BRAD LAVIGNE: Papi's Fajita Factory, Denham Springs, 6:30 p.m.
RACHAEL HALLACK: Sarita's Grill & Cantina, Denham Springs, 6:30 p.m.
DEBBIE LANDRY WITH BLAYNE COUPEL: On the Half Shell, Prairieville, 6:30 p.m.
CHRIS LEBLANC BAND: Creole Cabana, 7 p.m.
JUSTIN KARAM: Sullivan's, 7 p.m.
GRANT PEEPLES WITH ANNA GRACE BEAUTY: Dyson House Listening Room, 7 p.m.
TAYLOR RAE: Bottle & Tap, 8 p.m.
SARA COLLINS: Jolie Pearl Oyster Bar, 8 p.m.
LAZZRIPP BRASS BAND: Time Out Lounge, 8 p.m.
CAM PYLE DUO: 18 Steak at L'Auberge, 9 p.m. GLACIAL COFFIN, GREEN GASOLINE AND KAVYK: Mid City Ballroom, 9 p.m.
BLACK EYED SUSAN, YOUR MOM AND SHIPWRECKED: Phil Brady's, 9 p.m.
RIVUL: Laguna Beach Daiquiris, 9 p.m. THE MOJOES: Club Coozan, 9 p.m.
WARD DAVIS: Varsity Theatre, 9 p.m.
BRANDON TAYLOR: The Vineyard, 9:30 p.m. ESSENTIAL GROOVE: Churchill's, 9:30 p.m. THE MIXED NUTS: The Edge Bar at L'Auberge, 10 p.m. SORRY GHOST, 16 BUCK'S BAND AND STEELHOUSE: Varsity Theatre, 3 p.m.
MICHAEL BERTHELOT : LaContea Italiano Ristorante, 6 p.m.
MADI SWAN: La Divina Italian Cafe, 6 p.m.
RACHAEL HALLACK: Superior Grill Government, 6:30 p.m.
TYRONE GRINGOS: Sarita's Grill Cantina, Denham Springs, 6:30 p.m.
BIGG DADDY T: On the Half Shell, Prairieville, 6:30 p.m.
BATON ROUGE GRINDFEST: The Woodshop, 7 p.m.
EDDIE SMITH BAND: Lagniappe Restaurant, 7 p.m.
TAYLOR RAE: Sullivan's, 7 p.m.
AMANDA SHAW AND THE CUTE GUYS: Poydras Center, New Roads, 7 p.m.
NED FASULLO'S SALUTE TO SINATRA: Baton Rouge Magnet High School, 7:30 p.m.
MARCEL P. BLACK, REC RIDDLES, DOLLA BLACK AND SAZE': Southside Arts Center, 8 p.m.
BLU ROUGE: Backstreet Lounge, 8 p.m.
ACOUSTIC HOUSE: Jolie Pearl Oyster Bar, 8 p.m.
STEVE CONN TRIO: Red Dragon Listening Room, 8 p.m.
T-BOY & JUST US: Club Coozan, 9 p.m. THE VOYAGE BAND: Churchill's, 9 p.m.
DEWARE WALKER: Hollywood Casino, 11 a.m.
DAHLIA MUSIC: White Star Market, 11 a.m. THE NOLA JITTERBUGS: Superior Grill Highland, 11 a.m.
KIRK HOLDER: Beausoleil Restaurant, 11:30 a.m.
CAMERON DUPUY & THE CAJUN TROUBADOURS: The Edge Bar at L'Auberge, 2 p.m. THE WILDER JANES AND PUSHING CHAIN: Dyson House Listening Room, 4 p.m.
SLAY THE FLOW WOMEN'S HIP-HOP SHOWCASE: UpperCuts Barbershop, 7 p.m.
OPEN MIC BLUES JAM: Fat Cat Saloon, Prairieville, 7 p.m.
SOUNDCLASH BATON ROUGE: Ruffins, 8 p.m.
KIRK HOLDER: Superior Grill Highland, 6 p.m.
HENRY GRAY: Time Out Lounge, 6 p.m.
EDDIE SMITH BAND: On the Half Shell, Prairieville, 6:30 p.m.
ANDY BOURGEOIS DUO: Sullivan's, 7 p.m.
ABSOLUTE BLUES JAM WITH LIL RAY NEAL: Time Out Lounge, 8 p.m.
CAM PYLE: Superior Grill Highland, 6 p.m.
KIRK HOLDER: Bin 77, 6 p.m.
RHETT ANTHONY GLINDMEYER: On the Half Shell, Prairieville, 6:30 p.m.
STUART HADDAD: Sullivan's, 7 p.m.
CHRIS LEBLANC & LUTHER KENT: Time Out Lounge, 7 p.m.
DIXIE ROSE'S ACOUSTIC CIRCLE: Teddy's Juke Joint, Zachary, 7 p.m.
BONNIE & CLYDE: The Edge Bar at L'Auberge, 8 p.m.
CHRIS LEBLANC: Perkins Rowe, 6 p.m. HOT CLUB OF BATON ROUGE: Pointe-Marie, 6 p.m.
JEFF KRUMHOLT: Caliente Mexican Craving in Central, 6 p.m.
DONALD GELPI WITH LOGAN ASHLEY: La Divina Italian Cafe, 6 p.m.
TOMPLAY: Superior Grill Government, 6:30 p.m.
NEW ORLEANS KARMA: Sarita's Grill & Cantina, Denham Springs, 6:30 p.m.
RACHAEL HALLACK & ERIC CANTRELLE: On the Half Shell, Prairieville, 6:30 p.m. COZY LEN: Sullivan's, 7 p.m.
SETH WALKER AND GOOD MORNING BEDLAM: Dyson House Listening Room, 7 p.m.
ISLAND FEVER LIGHT: Time Out Lounge, 7 p.m. WHISKEY RIVER ACOUSTIC: Big Dog Saloon, Denham Springs, 7 p.m.
RUSTY YATES: Churchill's, 9 p.m.
YVETTE LANDRY & THE JUKES: Parc International, 5 p.m.
BEN MCGEHEE: Blue Dog Cafe, 6:30 p.m.
CALEB MORGAN: Bocat's at Cypress Bayou Casino, Charenton, 8 p.m.
JEFF BATES: Route 92, Youngsville, 8 p.m. THE WEST END TOUR: The Freetown Boom Boom Room, 8 p.m. THE MARSHALL TUCKER BAND: Mári Showroom at Paragon Casino, Marksville, 8 p.m.
NIK-L BEER: Rock 'N' Bowl, Lafayette, 9 p.m.
MOJEAUX: The Grouse Room, 9:30 p.m.
JONES AND HOLLERS: Blue Dog Cafe, 6:30 p.m.
RADIANT KNIFE, EAGLE CLAE AND WOORMS: The Freetown Boom Boom Room, 8 p.m.
HORACE TRAHAN & OSSUN EXPRESS: Rock 'N' Bowl, Lafayette, 9 p.m. SHOTGUN LILLIE: The Grouse Room, 9:30 p.m.
TRAVIS MATTE & THE KINGPINS: Route 92, Youngsville, 10 p.m.
DJ TRASHY WITH TEKK: Rox at Cypress Bayou Casino, Charenton, 10 p.m.
BEN MCGEHEE: Blue Dog Cafe, 11 a.m.
WARREN STORM AND WILLIE TEE & CYPRESS BAND: Vermilionville, 1 p.m.
WAYNE SINGLETON & SAME OL' 2 STEP: Route 92, Youngsville, 5 p.m.
GENO DELAFOSE: Rock 'N' Bowl, 5 p.m.
MOJOE BAND: Atchafalaya Club, Henderson, 5:30 p.m. THE WHISKEY BAY ROVERS AND THE JACKDAWS: Blue Moon Saloon, 8 p.m.
PEELANDER-Z: Blue Moon Saloon, 9 p.m.
DUSTIN GASPARD: Blue Dog Cafe, 6:30 p.m.
SHANNON MCNALLY: Blue Moon Saloon, 9 p.m.
RON HOTSTREAM: House of Blues, 7 p.m.
RAYO BROTHERS ALBUM RELEASE WITH WILL PAYNE HARRISON: Chickie Wah Wah, 8 p.m.
ELLIS MARSALIS QUINTET: Snug Harbor, 8 p.m. and 10 p.m.
SH*TSTORMTROOPER, MAN, THE ROBOT, CRIMINAL SLANG AND SOUNDING: The Circle Bar, 9 p.m.
KINGS OF BRASS: Three Keys at Ace Hotel, 9:30 p.m. KARMA: Rock 'N' Bowl, 9:30 p.m.
RICKY RETRO: The Willow, 10 p.m.
KERMIT RUFFINS & THE BBQ SWINGERS: Blue Nile, 11 p.m.
JAKE LANDRY AND THE RIGHT LANE BANDITS: House of Blues, 7 p.m.
HERLIN RILEY QUARTET: Snug Harbor, 8 p.m. and 10 p.m.
YVETTE LANDRY & RICHARD COMEAUX: Chickie Wah Wah, 8 p.m.
PENTAGRAM, BROTHER DEGE, DIRTY STREETS, RAISE THE DEATH TOLL AND CIKADA: The Howlin' Wolf, 8 p.m.
FREIGHT TRAIN RABBIT KILLER AND BLIND TEXAS MARLIN: The Circle Bar, 9:30 p.m.
90 DEGREES WEST: Rock 'N' Bowl, 9:30 p.m. THE SOUL REBELS: Blue Nile, 11 p.m.
BRUNCH WITH AMANDA SHAW: Rock 'N' Bowl, 10:30 a.m.
JON RONIGER: House of Blues, 6 p.m.
BOO RAY: Chickie Wah Wah, 8 p.m.
DAVY MOONEY QUARTET: Snug Harbor, 8 p.m. and 10 p.m. HOT 8 BRASS BAND: The Howlin' Wolf, 10 p.m.
SEAN RILEY: House of Blues, 6 p.m.
JUSTIN MOLAISON: Chickie Wah Wah, 6 p.m.
PAPA MALI: Chickie Wah Wah, 8 p.m.
CHARMAINE NEVILLE BAND: Snug Harbor, 8 p.m. and 10 p.m. THE DIRTY RAIN REVELERS: Hi-Ho Lounge, 10 p.m.
DJ DOUG FUNNIE: House of Blues, 6 p.m.
ANDREA GIBSON: House of Blues, 7 p.m.
RICKY SEBASTIAN QUINTET: Snug Harbor, 8 p.m. and 10 p.m.
EMILY KATE BOYD AND LAYLA MUSSELWHITE: Chickie Wah Wah, 8 p.m.
SETH WALKER'S RECORD RELEASE: Chickie Wah Wah, 8 p.m.
CREOLE STRING BEANS: Rock 'N' Bowl, 8 p.m.
THREE RIVERS TRIO: House of Blues, 7 p.m.
PUDDLE OF MUDD FEATURING AKADIA + VENTRUSS: House of Blues, 7 p.m.
CHRISTIAN WINTHER QUARTET: Snug Harbor, 8 p.m. and 10 p.m.
CARY HUDSON & DAVE JORDAN: Chickie Wah Wah, 8 p.m.
CHUBBY CARRIER: Rock 'N' Bowl, 8:30 p.m.